On December 20th, the Memphis monument dedicated to Confederate General Nathan Bedford Forrest was quietly removed by Memphis Greenspace. The non-profit had purchased the former Forrest Park (known as Health Sciences Park since 2013) earlier that day for $1000, giving it control over the Forrest monument. For the same price the city simultaneously sold its easement on Fourth Bluff Park, which held a Jefferson Davis monument (and a less well-known bust of Confederate soldier and Memphis journalist James Harvey Mathes). With $250,000 raised from a host of unspecified sources, Memphis Greenspace removed the monuments, and they remain hidden in storage awaiting their final fate. 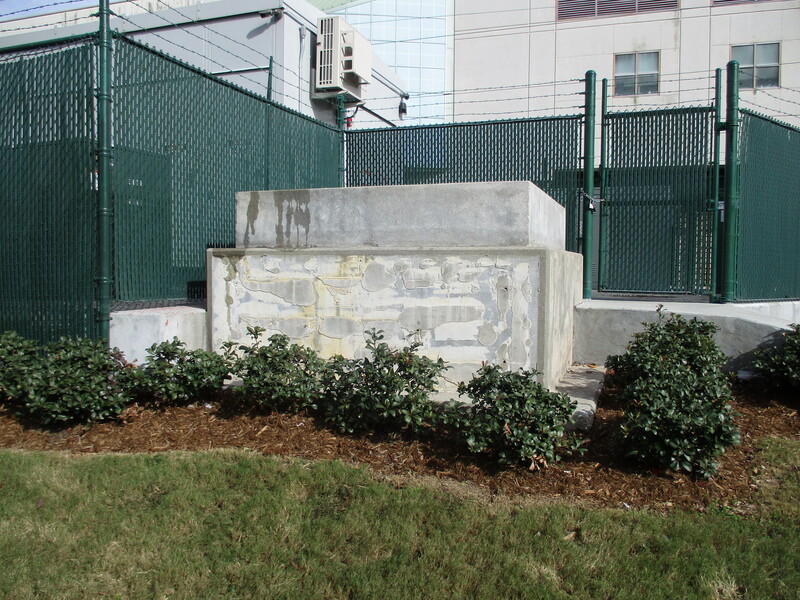 The plinth for Baltimore’s Confederate Women’s Memorial, which was removed in August, 2017 (image BalPhoto). Where the Forrest and Davis monuments once stood there are now empty pedestals or foundations that frame a whole new public discussion on heritage and memory. As Confederate monuments are removed from a host of public spaces, the absences they leave confirm shifting attitudes toward Confederate heritage even as they continue to evoke neo-Confederate memory and spark White nationalist activism. On January 6th, for instance, a handful of White nationalists protested near Health Sciences Park displaying the banner “`Diversity’ = White Genocide.” Another group unable to penetrate the circle of police surrounding Health Sciences Park drove around Memphis’ freeway in a “rolling protest” waving Confederate flags; however, some of those protestors distanced themselves from the unabashed neo-Nazis who gathered at the park that once held the Forrest statue. Dedicated in May, 1905, the Memphis Bedford Forrest monument memorialized perhaps the most polarizing of all Confederates. Forrest’s obituary in the New York Times labeled him “notoriously bloodthirsty and revengeful,” invoking Forrest’s role in the April, 1864 battle at Fort Pillow where his soldiers were accused of murdering a large number of African-American soldiers who had surrendered or were wounded. In 1880 one newspaper reported on the Forrest monument proposal and complained that “General N.B. Forrest’s treason is to be commemorated by a monument at Memphis.” Nevertheless, Forrest was celebrated by unrepentant Confederates as an unschooled but tactically brilliant field general. In 1891, Nashville’s The Daily American encouraged its readers to contribute to the Forrest monument fund, indicating that there “was no braver General in the Confederacy than N.B. Forrest; no officer more daring and heroic. The monument should be worthy of the man.” Planning for a Forrest monument began shortly after his death in 1877, and in 1901 the foundation for the statue was laid. The most sacred of all relics was buried at the monument site in November, 1904, when Forrest and his wife were exhumed and reburied at the feet of the monument’s pedestal. The couple remains buried in the park now, but it is expected that they will be re-buried in Elmwood Cemetery, where both were originally interred. 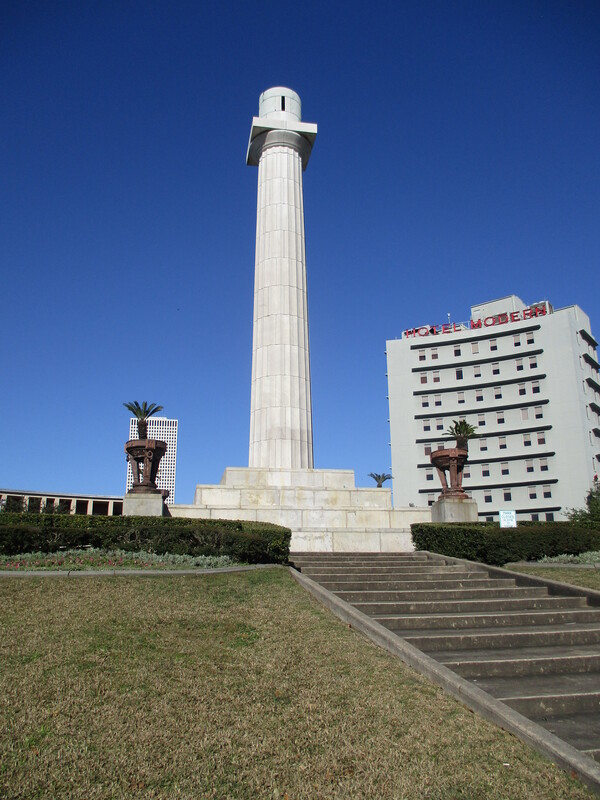 Once graced with a statue of Robert E. Lee, New Orleans’ Lee Circle now contains only the pedestal on which Lee once stood (image from author). The first wave of Confederate monument removals was in 2017, but there had been protests of Confederate monuments since the 1950s. The Forrest statue, for instance, was targeted by protestors in March, 1956, when the statue was splashed with white paint and its sabre removed, and a replacement sword was subsequently welded onto the Forrest statue. When the saber was again taken in 1962, officials decided not to replace it. In 1979 Memphis activist Isaac Richmond petitioned the city to remove the Forrest monument, likening Forrest to Hitler. In March, 1986 the statue was spray painted with “KKK,” and in September, 2013 Forrest’s monument had red paint and an anti-Ku Klux Klan message emblazoned on it. In August 2015 “Black Lives Matter” was painted across the base of the Forrest monument, and the Knights of the Ku Klux Klan offered to pay to move both the statue and the Forrest graves to its “Christian Revival Center” in Arkansas. In 2015 Isaac Richmond was again protesting the monument, and he and a group of protestors dug a ceremonial shovel of soil from the Forrest grave days after the Memphis City Council began to debate its removal. 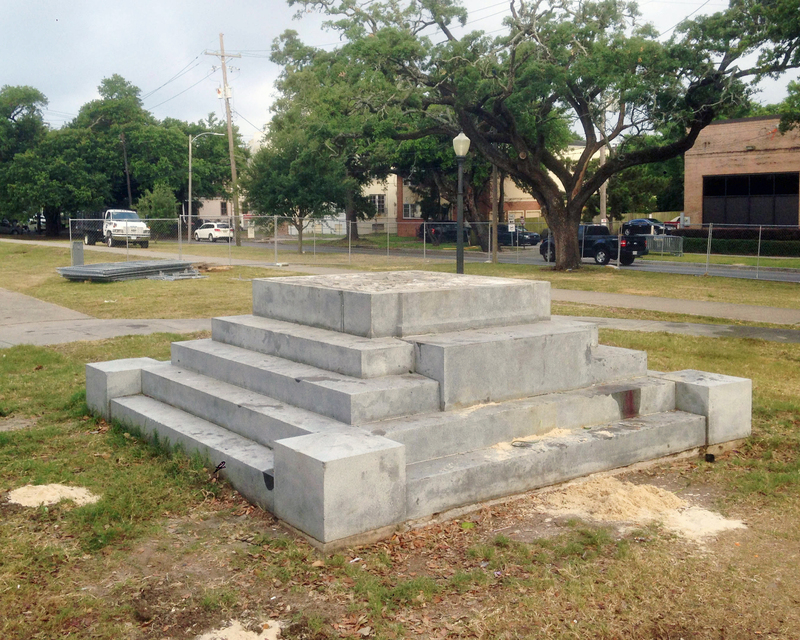 The empty pedestal for the Jefferson Davis Monument in New Orleans after its removal in May, 2017 (image Bart Everson). Deliberations over the removal of Confederate memorials intensified in the wake of the Charleston church murders in June, 2015. In August, 2015 the University of Texas moved a statue of Jefferson Davis from the campus mall to an indoor location (removing three more in August, 2017), and a year later Louisville, Kentucky relocated a Confederate monument to Brandenburg. However, most communities did not act until the wake of the “Unite the Right” rally in Charlottesville, Virginia. On August 11-12, 2017 a host of alt-right groups gathered in Charlottesville to contest plans to remove a statue of Robert E. Lee, and a protestor was killed in weekend violence. 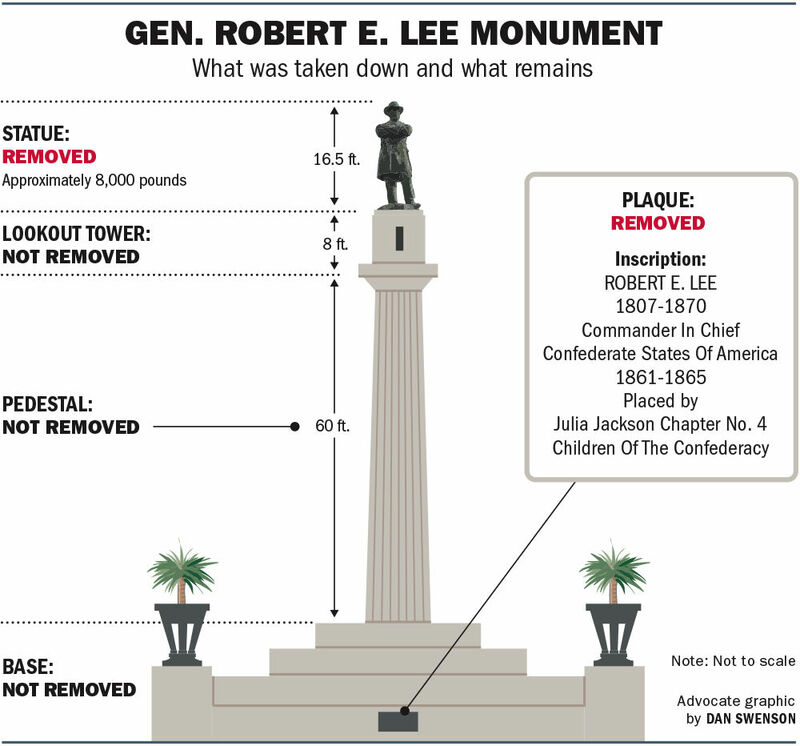 The most prominent removal of Confederate monuments prior to Charlottesville came in New Orleans, where four monuments were removed in April and May. Like the Memphis sites, the New Orleans monuments were removed but foundations, columns, and landscaped spaces once associated with the statuary remained behind. New Orleans’ Lee Circle, for instance, is still graced by a towering 60’ column and eight-foot “lookout tower” that Robert E. Lee had stood atop since 1884. 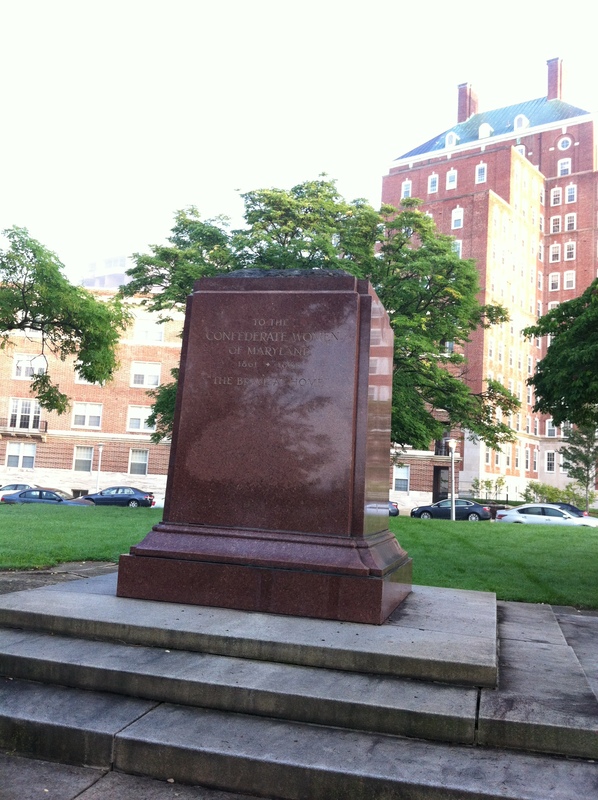 The 1891 Liberty Place Monument is also a foundation without the plaques and monument that decorated it for more than a century; and the General P.G.T. Beauregard and Jefferson Davis statues left behind the pedestals on which they once stood. A series of monuments was removed in the weeks and months after Charlottesville, and nearly all of them left foundations in their wakes. On the night of August 16th, for instance, Baltimore removed four Confederate monuments. One of these, the Stonewall Jackson and Robert E. Lee Monument, was dedicated in May, 1948 in the midst of a post-war revival of neo-Confederate politics. When State’s Rights Presidential candidate Strom Thurmond visited Baltimore that October he visited the new statue to pay homage to the rebel Generals then attended a rally at which 1000 people were waving Confederate flags and delivering rebel yells. Pablo Machioli’s papier-mache statue “Madre Luz” was placed atop the former Lee-Jackson statue pedestal in Baltimore after its removal, but it had fallen over by the following day (image Vera de Kok). Like nearly every Confederate monument being removed, the Lee-Jackson monument has been a magnet for activism since the moments it was being dismantled. While the statue was being removed August 16th, police monitoring the process permitted onlookers to take selfies, and afterwards a stream of observers took pictures of themselves on the empty pedestal. Baltimore Mayor Catherine Pugh suggested the pedestal eventually should have a plaque installed that outlines the monument’s history and describes why they were removed. 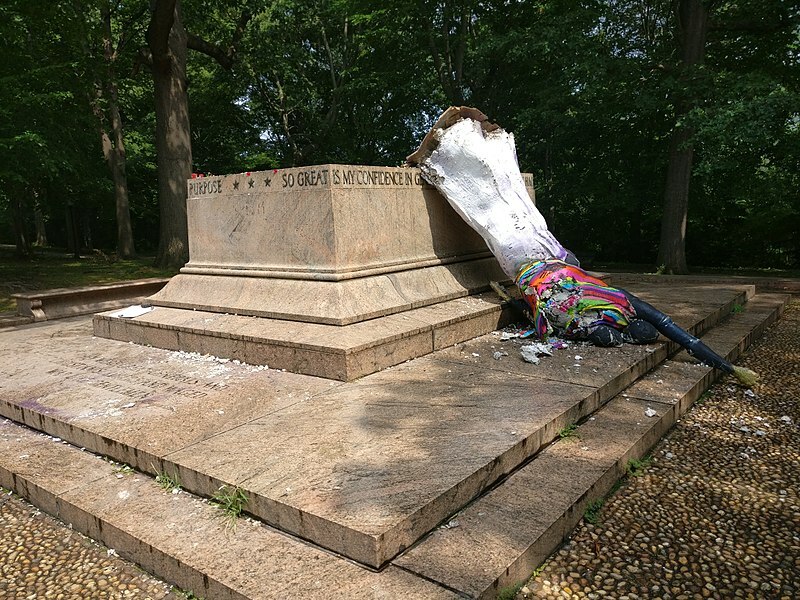 Within a day of the Jackson-Lee monument’s removal, protestors intent on redefining the space installed a papier-mache statue on the empty pedestal. Pablo Machioli’s “Madre Luz” depicts a pregnant Black woman with a baby on her back, and it was first temporarily displayed alongside the Lee-Jackson statue in 2015. When the Lee-Jackson monument was removed in 2017, “Madre Luz” was returned to the pedestal, though it was toppled off the pedestal within a day. Many more Confederate monument spaces have been graced at least temporarily with impromptu artworks. For instance, when the Baltimore monument of Supreme Court Chief Justice Roger Taney (who presided over the 1857 Dred Scott decision) was removed, Baltimore artist Shawn Theron placed a painting reading “Spread Love” on the empty pedestal. After a monument in Durham was removed by protestors a metal heart sculpture was installed on the vacated pedestal, only to be removed a day later. New Orleans plans to leave the foundation of the former Battle of Liberty Place monument empty as it stands today (image from author). Memphis’ sale of Medical Sciences Park was a unique effort to avoid laws that prevented the city from removing the Forrest and Davis monuments, and many other states’ Confederate landscapes are legally protected. Frustrated by such regulations on North Carolina monuments, on August 14th protestors in Durham, North Carolina toppled a 1924 rebel soldier statue off its foundation. In Boston, officials decided to cover a Confederate monument with a wooden box while they debate what to do with the statue; the Charlottesville statue of Robert E. Lee that sparked protests in Summer 2017 leading up to the Unite the Right rally remains in place, shrouded in fabric. 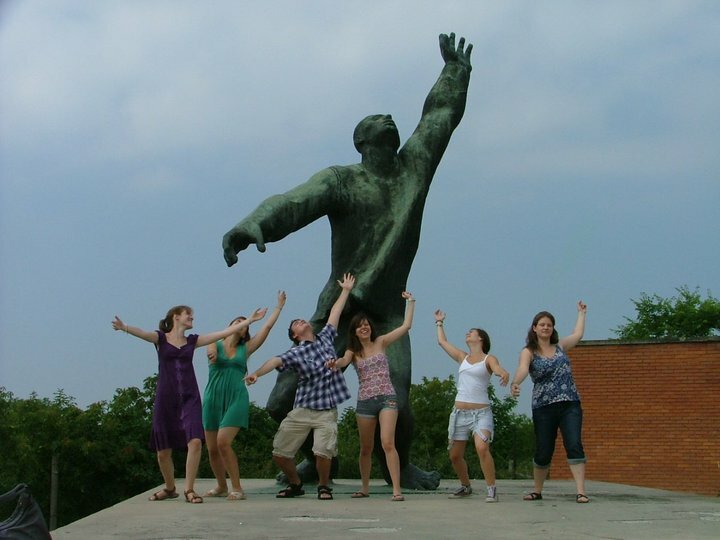 Hungary’s Memento Park is composed of Soviet-era statuary including this 1969 Republic of Councils Monument (image Memento Park). Some communities have concrete relocation plans for the monuments themselves, but others simply have placed the statues in storage. After a Confederate monument was removed from the Howard County, Maryland Courthouse grounds in August, it was given to the local Ellicott City Museum. In Gainesville, Florida the United Daughters of the Confederacy paid to remove the statue of a Confederate soldier at the Alachua County Administration Building, moving it to a local cemetery. Lexington, Kentucky monuments of Confederate General John Hunt Morgan and Confederate Secretary of War John C. Breckinridge were removed in October. The city suggests it plans to relocate them to Lexington Cemetery, where Morgan and Breckinridge are buried, but the statues remain in storage now. Baltimore likewise proposes to place its removed monuments in a local cemetery, but at the moment they are being stored awaiting a final decision. New Orleans announced in May, 2017 that it planned to install a water feature at Lee Circle, but the monument’s column remains isolated in the traffic circle now. The city indicated it had no plans to rehabilitate the Liberty Place monument site, instead resolving to leave the square foundation in place as a mute material testament to the brazen memorial to White supremacy. 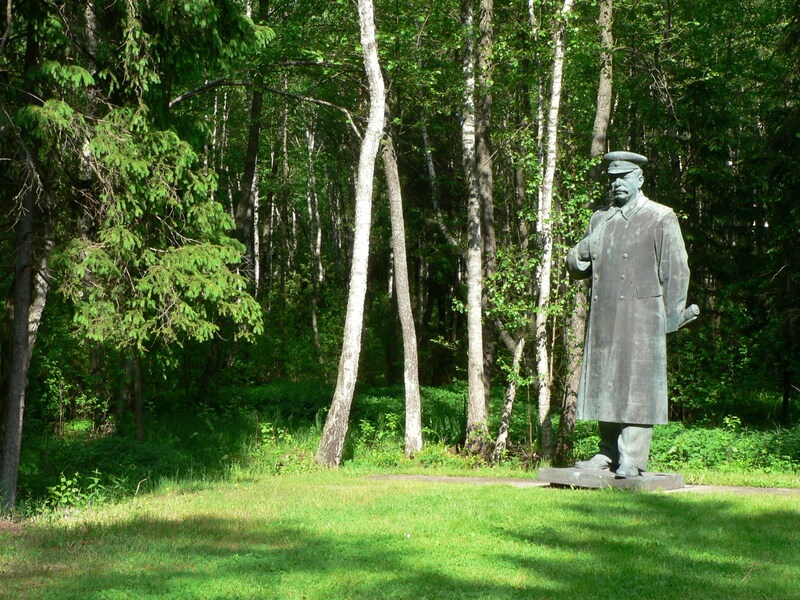 A statue of Stalin now patrols Lithuania’s Grūtas Park (image Wojsyl). Perhaps the absence of Confederate statuary will provide new spaces for celebratory monuments commemorating a new host of heroes and heroines (e.g., Missy Elliott), but that strategy risks simply reproducing a tired notion of triumphant public art. There is of course no single strategy for reclaiming the Confederate memorial landscape. 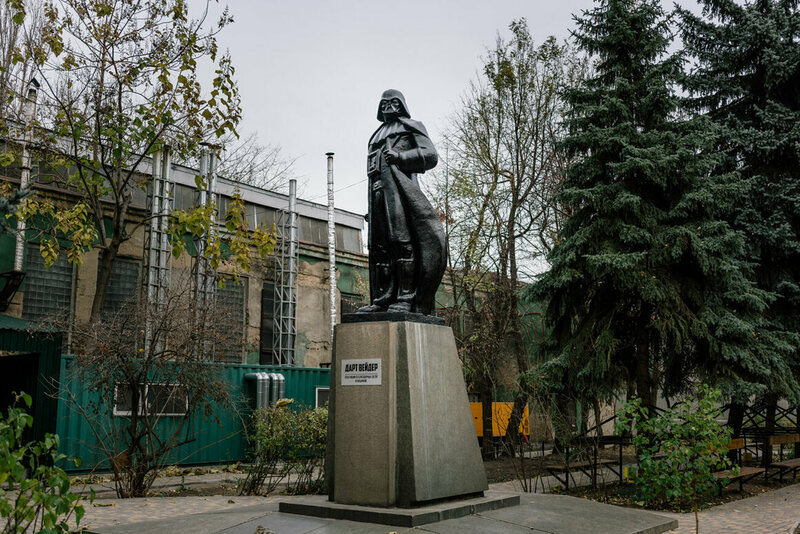 In the Ukraine, thousands of Lenin statues have been destroyed or decapitated, with one Lenin monument near Odessa now dressed as Darth Vader. In London, a blank pedestal in Trafalgar Square has been adorned with rotating commissioned works striking a variety of tones. 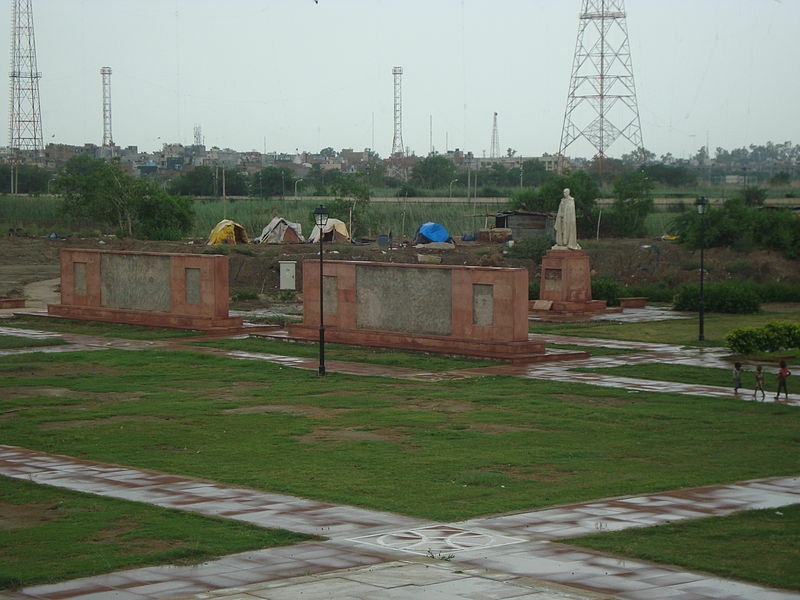 Dehli’s Coronation Park collects British colonial statuary in a park that appears to have temporary camps on its edges (image Harshanh). While most removed Confederate statuary now languishes in storage, other controversial monuments have been placed in new public contexts. For instance, Grūtas Park in Druskininkai Lithuania is decorated with 86 Soviet-era monuments as well as Soviet guard tower and camp remains. Memento Park in Budapest holds 42 Communist-era statues that simultaneously interprets Soviet tyranny and places monuments in new contexts inviting a host of group images that mock the statues’ ideological designs. After India secured its independence in 1947, Dehli’s Coronation Park became the home to a scatter of British colonial statues including a 49-foot high marble monument to King George V. Once the site of three royal celebrations known as Durbars, the park today holds colonial busts, statues, and empty plinths that have largely fallen into disinterested ruin. The empty pedestal from Baltimore’s Soldiers and Sailors Monument (image Vera de Kok). The Confederate memorial landscape and the statuary removed from it will inevitably remain disputed things. Efforts to simply efface them are unlikely to be an especially effective mechanism to illuminate the White supremacy that has routinely distorted Confederate history. Empty pedestals and plinths may well materially shape public discussions on Civil War heritage and color line privileges that Confederate statues have often masked and evaded. Some communities have championed moving the Confederate monuments to cemeteries apparently removed from public reflection, and others have suggested placing these statues in museums might provide a sanctioned reading of Civil War heritage. Those approaches may work in some ways, but the absent voids left by Confederate monuments can provide important public material confirmation of neo-Confederate history-making and memorialization. 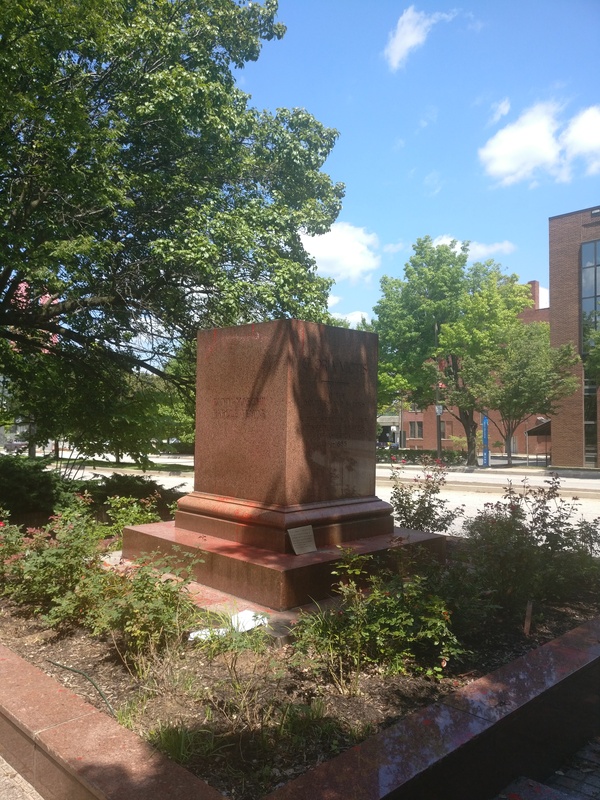 Empty plinths may become visible scars effectively illuminating the ways race and privilege have long concealed themselves within Confederate memorialization. Posted on January 15, 2018, in Uncategorized and tagged civil war, Confederate monuments, Memorialization. Bookmark the permalink. Leave a comment.